Fatalities via car accidents are the biggest source of organ donations today. If autonomous vehicles eliminate 90% of those accidents as Google predicts, organ donations will plummet. This will likely drive an intersection with 3D Printing, as the potential for this outcome drives more investment in enabling 3D printed organs in order to offset the loss. The importance of seeing as many outcomes as possible is highlighted by this scenario, as these intersections are not readily apparent. If renewable energy is to reduce or eliminate our reliance on fossil fuels, it requires a mechanism to store surplus energy, a bi-directional grid, and an ability to match supply and demand. The same sharing economy mechanisms that optimize the matching of driver and rider, or guest and room provider could enable renewable energy at scale by linking surplus energy with demand. If you also combine the nanotechnology innovation accelerator, you begin to see the same reduction in solar panel size (and therefore broader adoption) that we’ve seen in the electronics area. 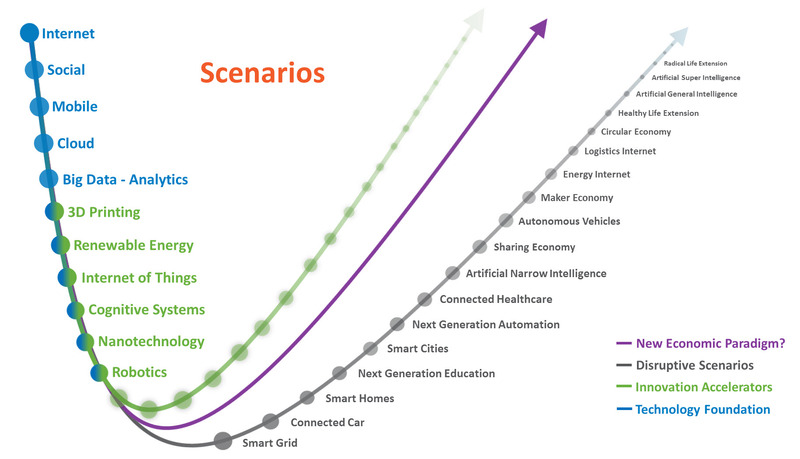 This highlights a key accelerant: the convergence across the sciences and with technology puts everything on the same exponential curve that technology has enjoyed for years. This information enablement of just about anything is a fundamental driver of exponential progression. Now let’s take the last scenario a step further. If you combine renewable energy, sharing economy mechanisms, nanotechnology and the Internet of Things, you create an Energy Internet that does for energy what the Internet did for communications. The energy platform of the future could indeed be the product of combinatorial innovation, with the Internet of Things at its foundation. Resource consumption could be a difficult societal challenge as the world sees 3 billion more consumers by 2025, and 5 billion in the middle class by 2030. This speaks to a potential scarcity scenario. But, as the convergence of sciences and technology drives us towards a world of abundance versus scarcity, the need for traditional resources could be eliminated altogether. So which is it? This combinatorial scenario is interesting, as 3D printing enables a maker economy that converges with the sharing and circular economy to alter the resource consumption mix. Autonomous vehicles and renewable energies contribute to this shift, as lighter cars designed for experience change the parts mix, while solar panels require more steel. These combinatorial examples make it clear that isolated analysis of any given disruptive scenario is not sufficient. The true disruptive power lies at the intersections. Understanding these combinations helps us exploit disruptive opportunity; versus succumbing to disruptive stress. This same ability to combine and disrupt provides a platform for next generation efficiency and effectiveness. However, isolated efforts won’t get us there; the power lies at the intersections. ← Is Any Industry Safe From disruption? #OurCombinatorialFuture – nice way to show how combinations of the innovations created hugely different outcome opportunities. Let’s discuss Blockchain on this Visual.